It is alleged that, in late 1869 or early 1870, a photographer entered Hugh F. O’Lone’s Red Saloon, a bar near the intersection of Portage Avenue and Main Street in Winnipeg (the site now buried under a widened Portage Avenue), and took a photograph of Louis Riel surrounded by several other men, said to be his “councillors.” Some sources have drawn the conclusion that the men were members of Riel’s Provisional Government. Back row (L-R): Bonnet Tromage, Pierre Delorme, Thomas Bunn, Xavier Pagé, Andre Beauchemin, Baptiste Tourond, Thomas Spence. 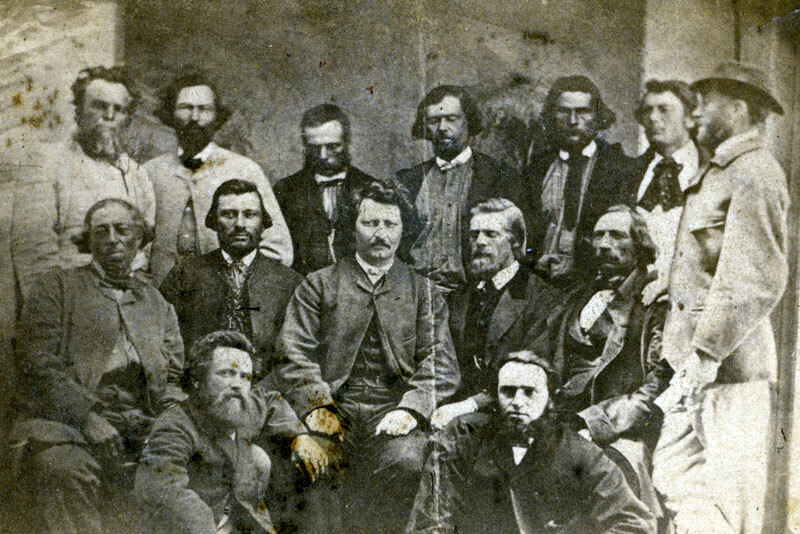 Middle row (L-R): Pierre Poitras, John Bruce, Louis Riel, William O’Donoghue, François Dauphinais. Front row (L-R): Hugh (or Bob) O’Lone, Paul Proulx. The identity of the photographer for the photograph is, as yet, unknown but speculation falls on two men known to have been working in the Red River Settlement around this time: Joseph Langevin or Ryder Larsen. “A ghastly find. Are they the remains of Thomas Scott?,” Manitoba Free Press, 18 September 1896, page 1.